All-Pro Mechanical is proud to serve the Coldwater community! About Coldwater, MI - Happy to be your hometown Heating & Air Conditioning Contractor! 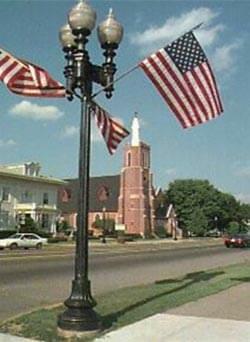 Coldwater is the county seat of Branch County, Michigan, and its total population is roughly 11,000. Although politically independent, the city is located in the mile of Coldwater Township. The Coldwater River flows into this city, but a majority of the 8.27 square miles of total area that makes up the community consists of land. The climate for this region of the state is a typical Midwestern, humid continental zone with cold winters that feature significant snowfall. Summer months are often humid and quite warm. Despite the modest size of Coldwater, there are some attractions located here. Art enthusiasts, especially those that enjoy the performing arts, may enjoy checking out a show at Tibbits Opera House or the Capri Drive-in Theater. For individuals that want a more action-packed activity, Adventure Zone is a great option. Additionally, sports nuts who enjoy playing a round of golf may want to check out the Blackberry Patch Golf Club or Bella Vista Golf Course.